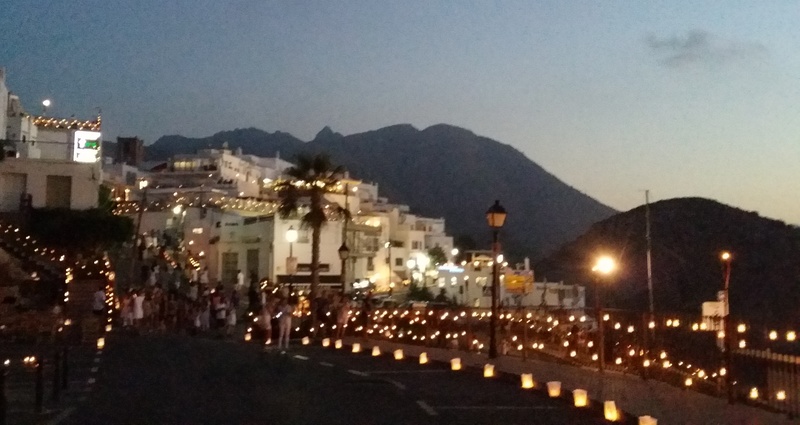 For the sixth year, Mojácar held its ‘Candlelit Night’ and, although it was impossible to put a figure on how many were in Mojácar’s Old Town to enjoy the party, the amount of people surpassed even the most optimistic forecasts. Nine buses were used, which then had to reinforced by three more, but still queues built up with the bus company accounting for more than 16,000 passengers. Taxis, motorcycles and cars did not stop trying to go up all night and, parking was almost impossible from 8 p.m. onwards. Going on these figures, there could have easily been some 19,000 in the Old Town, enjoying the most magical evening. The figures from the Tourist Office indicate that from August 5 to the actual day, 82,000 showed interest in the night of the candles with 113,855 hits recorded overall in the week. Everything began at 10.00 p.m. when the Town switched off all public lighting with private houses and shops following ‘the blackout’, allowing Mojácar to be lit only by candles. Restaurants and bars were fully booked days before and found themselves literally overwhelmed by the public, until stocks ran out. The Town Council and the Mojácar Pueblo Merchants Association, organizers of the night, purchased more than 6,000 candles and 1,000 torches, adding to those in the restaurants, shops and private homes. The image of Mojácar, looking more beautiful than ever, the evening’s open air concerts, street entertainers juggling with fire, eight telescopes to observe the full moon in all its glory with the shooting stars, all made it an unmissable night. It is so special because it is one of the few, if not to say the only night in Spain, when a town remains lit only by the flames of the candles. The resounding success of the night is now followed by the Council and the Association of Merchants planning for next year, looking at the improvements they can make and further attractions they can offer.